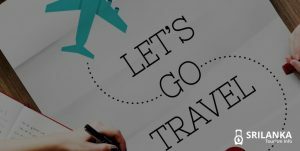 Home » Eat N Drink » What to Eat in Sri Lanka? 10 Must Try Dishes! Sri Lanka is an amazing country that is diverse in terms of its culture, tradition, people and cuisine. Sri Lankan food is a medley of spices, seasoning and flavours that burst open in the mouth and transposes the taste buds to another realm. Besides the tea plantations, enchanting temples and idyllic beaches, the local cuisine served in Sri Lanka draws a large number of tourists every year. They set out on a food trail to see the varied options the beautiful island has to offer. When visiting Sri Lanka, there are two things you must know about their food. Rice and curry are two staples when it comes to any type of meal served. The pearl of the Indian Ocean is often referred to as the Island of Rice and Curry too. 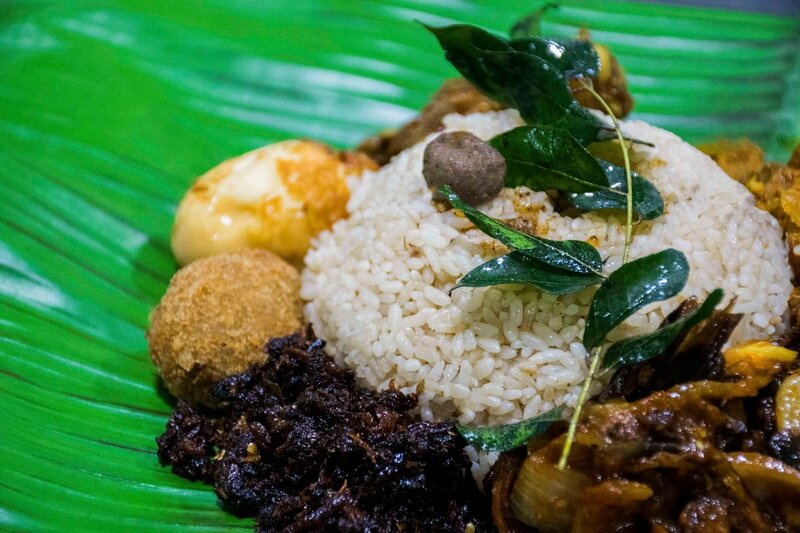 Sri Lanka’s incredible cuisine makes use of locally-grown tropical fruit – coconut and jackfruit, fresh seafood and an arsenal of spices to satiate every traveller’s hunger pangs. The curry concoctions and tasty dishes have shaped Sri Lanka’s food culture. 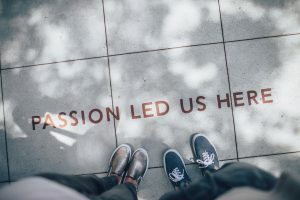 While fancy restaurants such as Ministry of Crab serve the best seafood, it is street stalls and home kitchens where you’ll actually find authentic, Sri Lankan cuisine. There’s a common misconception that the food served in Sri Lanka is mainly for meat-eaters and seafood lovers. However, there’s very little truth in that as there are plenty of dishes that suit vegetarian taste buds as well. 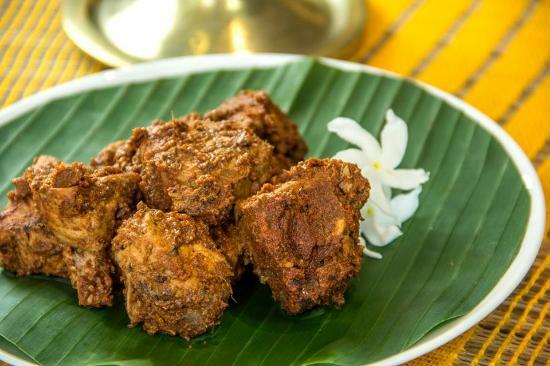 On your next voyage to the teardrop of India (nickname for Sri Lanka), here are some exclusive dishes prepared by the local Lankans which you must try. Warning: The article will make you hungry! 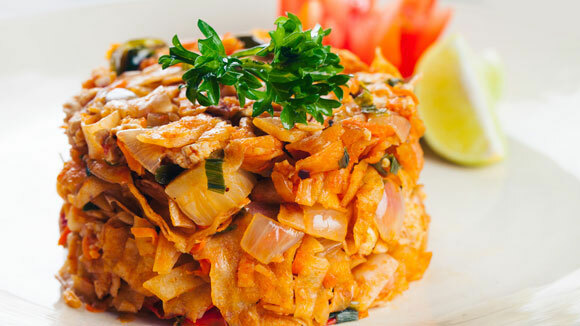 Most roadside food stalls make this signature Sri Lankan dish – Kottu. When you hear clanking of metal on metal in a nearby Sri Lankan market, it means Kottu is being prepared. Often referred to as Sri Lanka’s hamburger, it is the go-to food for the locals. Though the dish closely resembles fried rice, it is made with roti (Indian flatbread). At the beginning of the day, the street food vendors prepare rotis and stack them up. The dish features pieces of broken roti mixed together with finely shredded vegetables, meat, spices, ginger, garlic, egg and cheese. The beauty of this dish is that it is made on a flat iron skillet with a person quickly working his hands with two blunt knives. So, even if you are a mile away, you’ll be able to tell that Kottu is being prepared. Locals and travellers find this dish extremely comforting since it is lightly spiced. A Sri Lankan delicacy that is prepared with rice flour and locally referred to as appa or appam is a very popular breakfast food in Sri Lanka. The batter is made with rice flour, coconut milk and a hint of sugar. Typically, there are two versions of hoppers served. The first one closely resembles a pancake while the second resembles noodles. The pancake version involves a ladle of batter fried in a small wok. Hoppers are served in both savoury as well as sweet forms. The most popular of them all is the egg hopper wherein an egg is cracked in the middle of the bowl-shaped pancake creating an ‘egg in the hole’. On the other hand, string hoppers are prepared with the help of a noodle press. The rice flour batter is pressed into the device and then steamed. They are then eaten with coconut sambal, dahl curry and a coconut milk curry. Ambul Thiyal is one of the most popular seafood dishes throughout the island. The flavourful curry is prepared with tuna and a unique blend of spices including turmeric, black pepper, cinnamon, garlic, pandan leaves and curry leaves. 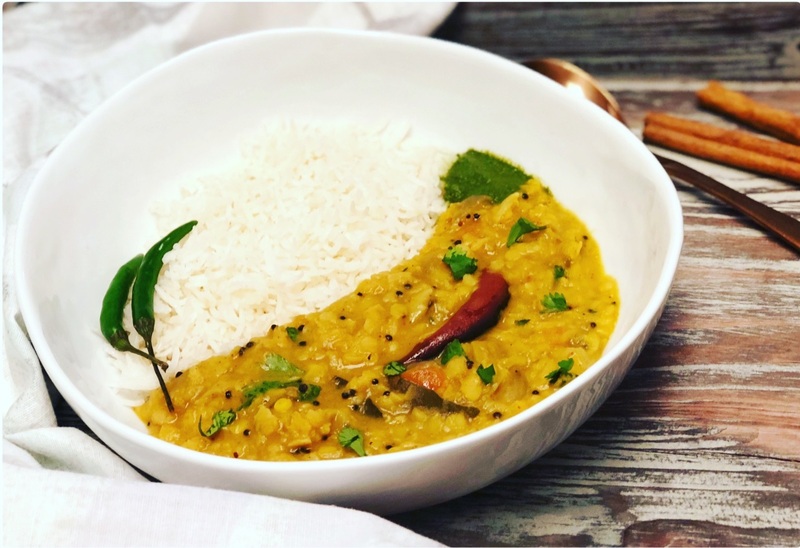 The most important ingredient in this dried fish curry is dried goraka (Malabar tamarind) which gives the dish its unique tangy flavour. Initially, the curry was prepared to mainly preserve a different kind of fish in Southern Sri Lanka. However, soon it became a favourite picnic curry with the locals. It is often eaten with rice, roti bread or string hoppers. Apart from seafood, you’ll find a variety of dishes that use chicken as their staple ingredient. 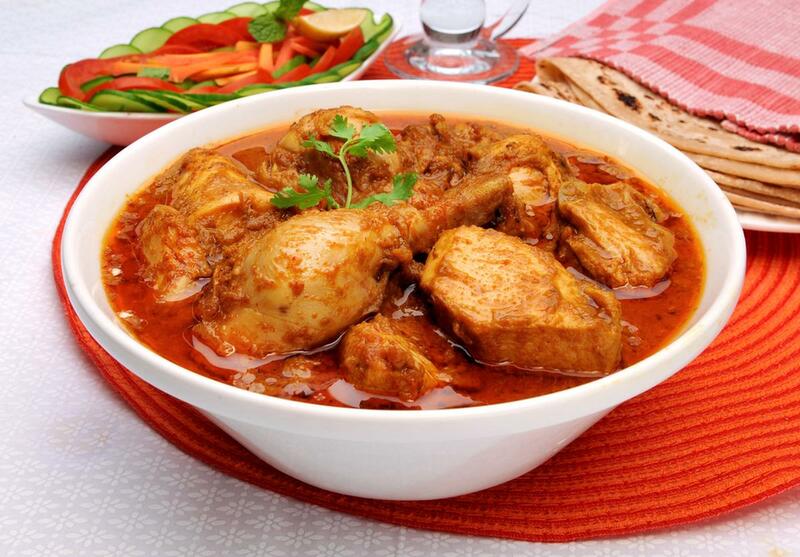 The Sinhalese (people of Sri Lanka) prepare an authentic chicken curry that is an amalgamation of spices such as fennel seeds, cardamom, cloves and cinnamon sticks. A marinade is prepared with hot oil and more spices including chilli powder, curry powder, turmeric, lemongrass and curry leaves. While the dry ingredients give the chicken a beautiful texture and aroma, the real flavour comes from two base ingredients which are rich coconut milk and tomato puree. It tastes best when had with steamed rice or roti bread. Parippu or dhal curry is a favourite in every Sri Lankan household. The curry is similar to the Indian dal except that the Sri Lankan version is a bit more concentrated than diluted. Split red lentils or masoor dal is used for the preparation. The curry is prepared with a beautiful blend of spices including cumin, turmeric, fenugreek, curry leaves and mustard seeds, and sautéed with onion, tomato and green chillies. To give the dhal curry a creamy and rich texture, it is often finished off with a splash of coconut milk. In certain parts of Lanka, more coconut milk is added so that it can be relished as a soup. However, the original dhal curry is served with string hoppers, rice and appam (pancake). The Dutch community had a huge influence on the Sri Lankan delicacy and culture. A Dutch word which translates itself to a ‘pack of food’ is something you will find all along the island and is difficult to resist. It comprises of boiled eggs, eggplant, Dutch-style beef balls, rice and sambol chilli sauce all wrapped in a banana leaf and steamed. Cloves and cinnamon are the main spices used which make the pork, lamb or beef tender and flavourful. As mentioned earlier, the Sinhalese love their jackfruit as it is available throughout the island. The amazing tropical fruit is consumed at various stages of ripeness, from very ripe and sweet to green and starchy. 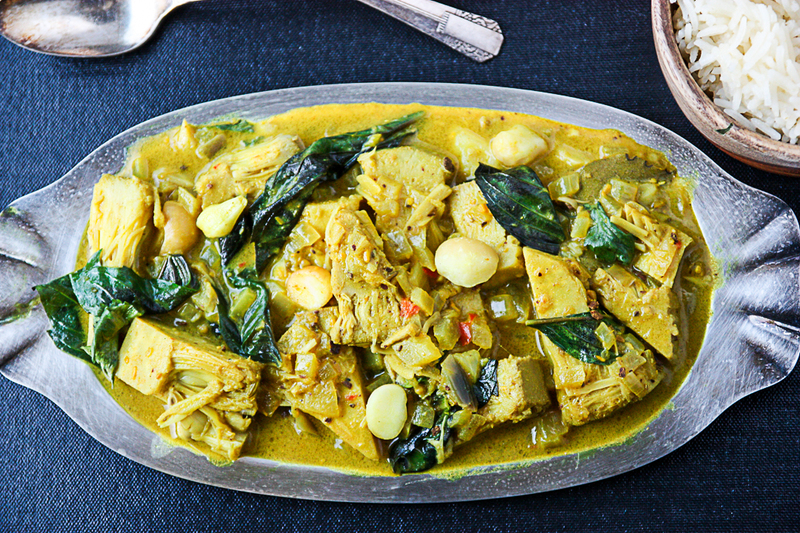 For the Polo curry, the jackfruit is cut into small chunks and boiled until soft. It is usually sautéed in onions, garlic and ginger and slathered with a whole lot of spices including mustard seeds, turmeric, chilli powder, curry powder and pandan leaves. The final step is to add coconut milk and reduce it till it evenly coats all the jackfruit cubes. Since jackfruit has a similar starchy texture to potato, it tastes amazing with roti and hot rice. The curry is mostly consumed for lunch. It is a great choice for vegetarians visiting Sri Lanka. By now, it’s pretty obvious that Sri Lankans love coconut milk more than anything else. 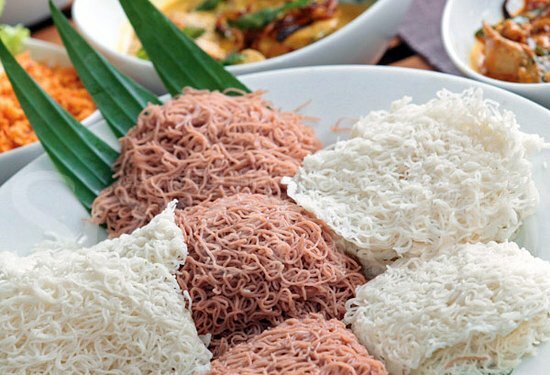 Nearly all their dishes have a hint of coconut. Another popular coconut-based dish is Kiribath. 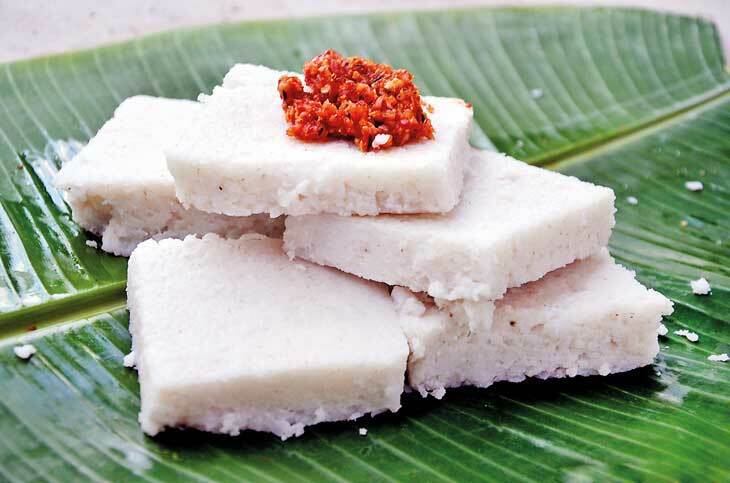 It is a rice cake that is soaked in coconut milk. It is a local dish prepared during festivals and special occasions. Though it may sound like a sweet dish, in reality, it is mostly served as a savoury item. When served as a breakfast dish, it is cooked with onion sambola and a mix of spices. When the rice is cooked with honey and bananas, it makes a lovely sweet dish. Even if you are not a big fan of coconut cream, you must give kiribath a try when in Colombo. If you walk through the local Sri Lankan market, chances are that you will see food stalls serving wood apple. Native to Sri Lanka, wood apple is a Southeast Asian fruit that is the size of a de-husked coconut. Since it has a pungent aroma, it I almost impossible to miss. 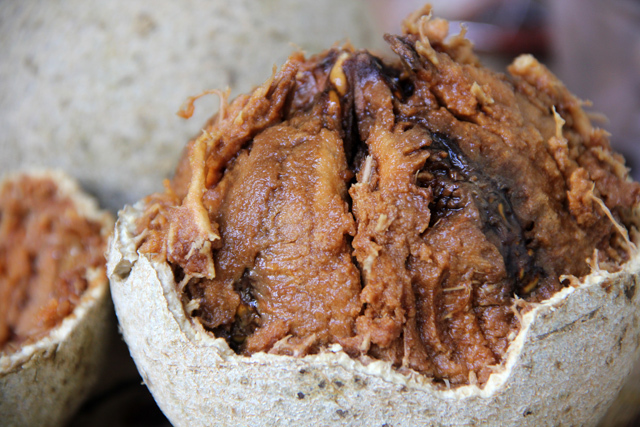 The inside of the shell has a dark brown paste that resembles a tamarind pulp and fermented raisins. The fruit is consumed by the locals on a regular basis as it aids digestion and has a large number of health benefits. Few food stalls also prepare a wood apple smoothie/juice with jaggery and water. Derived from the Indian word ‘achar’, achcharu is the Sinhalese word for a pickle. It is had as a side to enhance the flavour of any ordinary meal. The flavours are bold, crunchy, spicy and full of zing. Different fruits and vegetables are used in the preparation of achcharu. People’s favourites include mixed vegetables, ambarella, mango and pineapple. 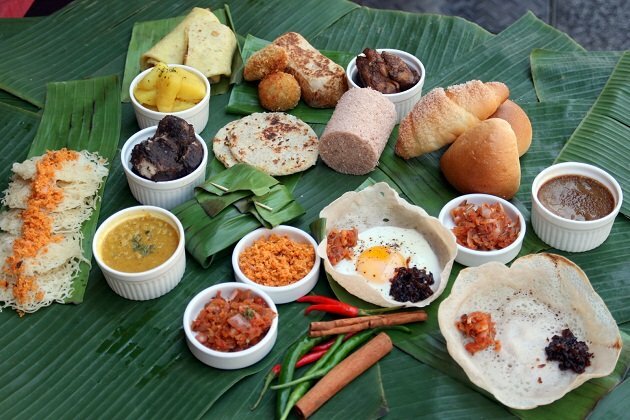 Compared to other cuisines of the world, Sri Lankan food oozes with punching flavours. Many people say that the food served in Sri Lanka is not for the timid eaters since it is spicy with powerful flavours. Another thing native to Sinhalese cooking is the predominant use of cardamom and curry leaves. Since most of the spices are grown within the island, they are bursting with flavour and can turn any bland dish into a highly appetising meal. Every household in Sri Lanka has their own unique way of preparing a dish. For example, rice and curry prepared in the Southern province will taste completely different from that prepared in the East. Whichever parts you visit, don’t be afraid and intimidated by the strong flavours the dishes have to offer. A big bowl of rice and a tongue-searing curry is something you will definitely relish. Have you been to Sri Lanka lately and tried some dishes apart from the ones mentioned in this blog? 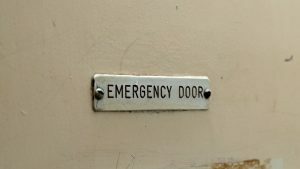 We would really appreciate it if you could let our readers know.